So yes, I know Christmas is only four days away. I have to admit I've not been very organised this year - I totally forgot about Nikolaus, I haven't baked a Christmas cake or mince pies (yet), we haven't decorated the flat, and we didn't even host a Christmas party. In fact, the extent of my Christmas spirit this year has been watching a lot of Christmas specials on Lifestyle Food (Nigella, Jamie, Nigel, Donna, Lorraine), and really really looking forward to the week off! I haven't done much planning, but fret not - we are having a proper Christmas Eve supper and Christmas lunch, as well as a couple of low-key foodie Christmastime catch ups with friends. The turkey and ham have been ordered, and today was spent at the market picking up supplies. Fun! Watch this space. 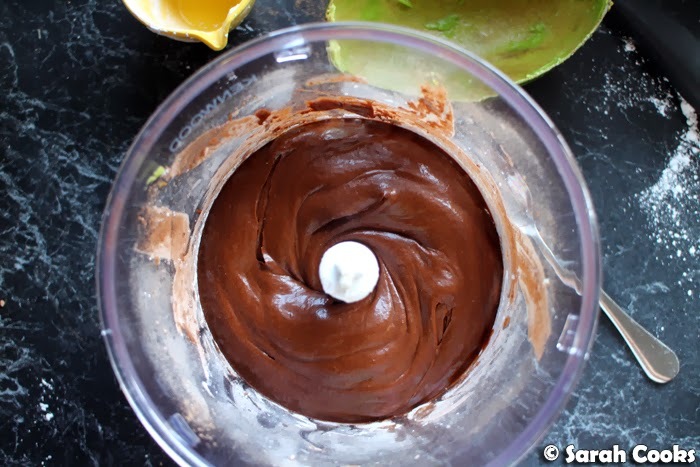 In my "avocado dessert" Googling, I came across this avocado-chocolate frosting on Paleo Spirit, and couldn't believe how rich, luscious and how chocolaty it looked, despite being 100% vegan - no cream, milk, butter or chocolate. I had to try it! I skipped Joy the Baker's bright green avocado buttercream and made the choccy avocado one. (Of course I completely un-Paleo'd it by using super refined icing sugar instead of the suggested maple syrup, haha). 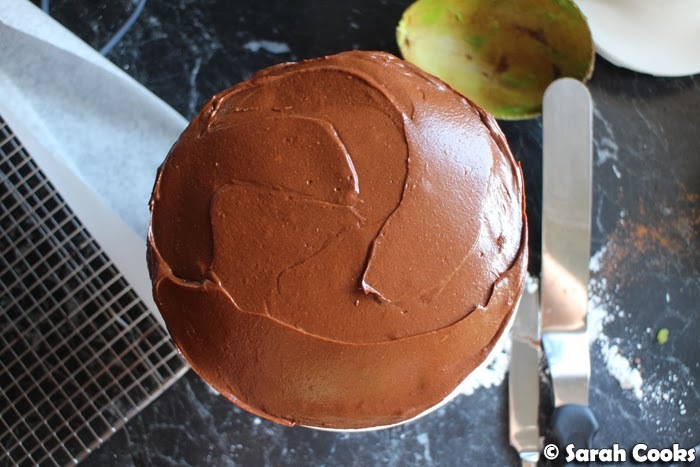 Let's look at the icing - it's just a mixture of ripe avocados, cocoa powder and icing sugar, blended until smooth and creamy. I couldn't believe it - twenty seconds in the mixer and bang - it turned into this amazing glossy icing. Of course I had to taste test, and you couldn't taste the avocado at all - it just tasted like dark chocolate, thanks to the cocoa powder. 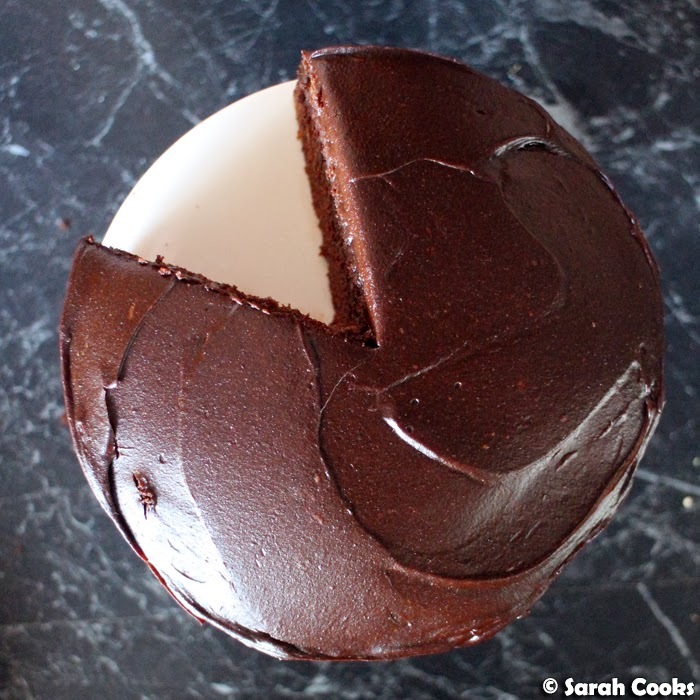 The quantities in the recipe I've given below make a very dark-tasting icing, definitely a grown-up taste. If you want something sweeter, I'd suggest starting with half the amount of cocoa and then adjusting to your liking. 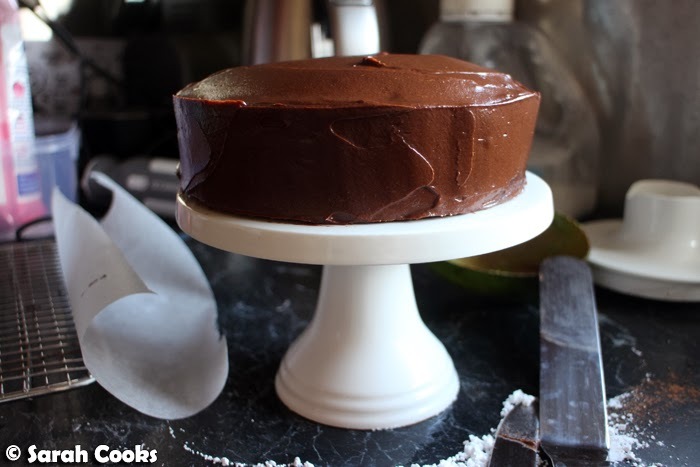 The icing was a dream to work with - so smooth and creamy! 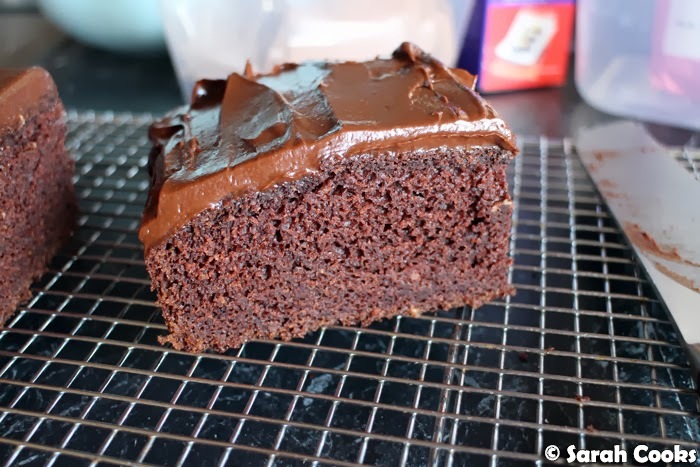 It was way easier than a normal ganache or a standard chocolate buttercream as it doesn't seize up or set - it stays velvety smooth for ages. Joy's recipe makes two 20cm cakes, which she makes into a sandwich cake, but I wanted something smaller that was easier to share around, so I did a small 18cm round cake, as well as a 20cm square slab cake. I was so impressed with the cake too! Again, despite the inclusion of avocado and the lack of eggs, it didn't taste odd or have an unusual texture - it was just a moist chocolate cake. I shared the cake with friends and colleagues - and none of them twigged that there was anything unusual about it until I mentioned that it included avocado. 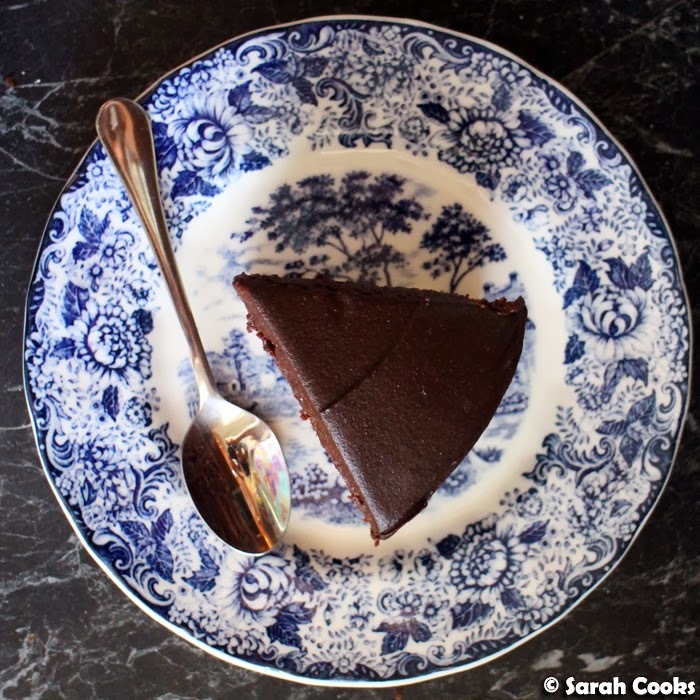 An easy-to-make crowd-pleasing chocolate cake that also satisfies a bunch of dietary requirements? Win win win! Preheat the oven to 175C. Line two 20cm round cake tins with baking paper. (I used a 20cm square tin and a 18cm round cake tin). Sift together the flour, cocoa, salt, baking powder and baking soda into a mixing bowl and set aside. Whisk together the oil, mashed avocado, water, vinegar and vanilla extract, followed by the caster sugar. Mix the wet ingredients and dry ingredients together, whisking until smooth. Pour the batter into the prepared tins. Bake for 40 minutes to an hour, or until cooked when tested with a skewer. 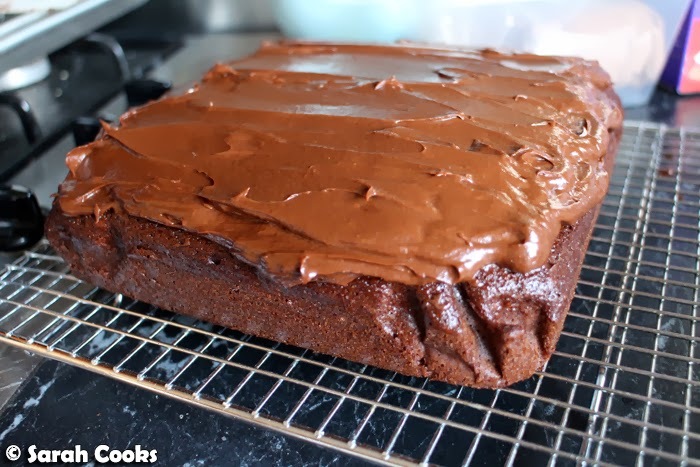 Allow to cool in the tins for 10 minutes, then turn out onto a cake rack to cool completely. 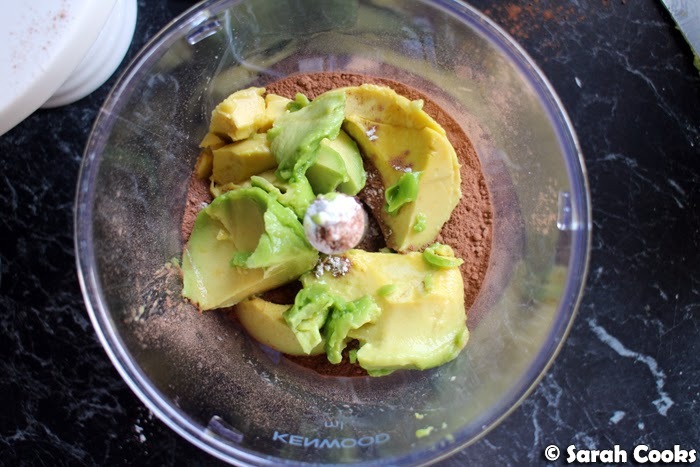 Place the avocado flesh, cocoa powder and icing sugar in a food processor and whizz to combine. Add a tablespoon of water if necessary to achieve a spreadable consistency. Spread the icing over the top and sides of the cold cakes in a swirly fashion. Wow that icing looks just amazing - am going to try it out for sure. This is a fabulous post! I have a good friend who's vegan and i'm always trying to bake for her. 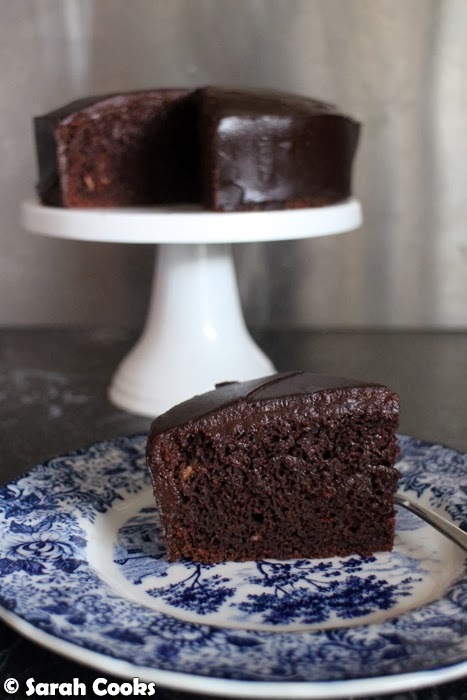 I've tried a chocolate beetroot tofu cake and it turned out well. Will definitely be trying this one out for her. It looks and sounds lush, Sarah. 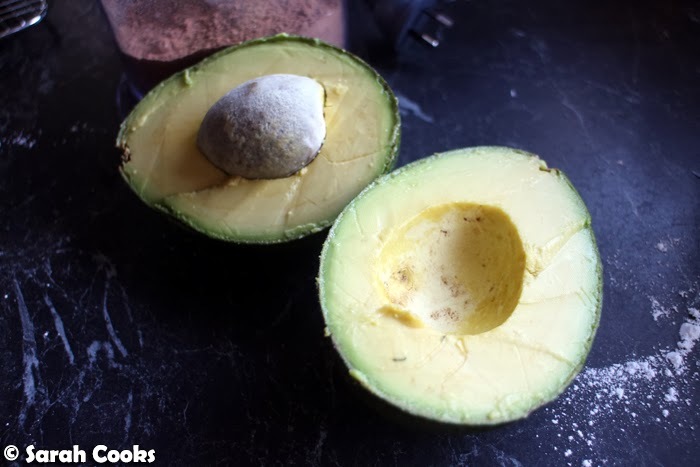 I love avocadoes though it's not easy to come across a perfect one here. Will you consider jumping on the Paleo bandwagon?? Sounds awesome! I haven't really graduated to having avocados like that - for me, its still very much something I have on toast, or in salads. Cooking it hasn't come to mind yet! I just made it and dubbed as THE chocolate cake! Just loved it... Thank you very much for sharing this recipe.